The Covered California Storefront Program was designed to increase the visibility of free, local and confidential in-person enrollment assistance for consumers. 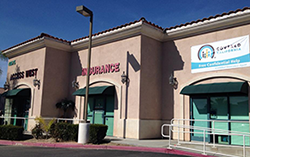 Certified Insurance Agents and Certified Enrollment Entities (also referred to as Community Partners) can connect to the Covered California brand by electing to open a Storefront in their community. Participation in the program is free. Consumers looking for local, in-person assistance with their application can use the Storefront Finder Tool to search for Storefronts by zip code, days/hours of operation, and languages spoken. In-person enrollment assistance plays an instrumental part of the Covered California mission by helping consumers understand their options and successfully enroll into coverage. Storefronts provide an opportunity to connect with harder to reach consumers and current members who want to review their options with certified and licensed professionals. Watch our consumer facing video in English and Spanish and review our User Guide to learn how consumers connect to Covered California Storefronts! Only Certified Insurance Agents and Certified Enrollment Entities are accepted into Covered California’s Storefront program and made searchable through the Storefront Finder Tool at CoveredCA.com. Provide a commercial location accessible and visible from the street. Display approved Covered California branded signage and conform to the signage requirements as outlined in the next section. Open to walk-in traffic for the duration of participation in the Storefront Program. Provide consumers a clean, safe and professional environment without clutter or hazards. Interior of storefront must provide a private area where enrollment assistance is conducted and conforms to Covered California security and privacy policies. Operate during core business hours (i.e. Monday – Friday, 9am – 5pm) - preferably offering extended weekday and/or weekend availability during open enrollment periods. Be certified with Covered California and in good standing. Commit to providing Covered California with updates any time the information on your application changes or you no longer wish to participate in the Storefront Program. The Change Request Form can be found here. One photo of the building exterior which conforms to the signage requirements in the next section. One photo of the interior which shows a clean, professional and private space where consumers can be assisted. Exhibit direct and clear angles that show what a consumer would see from the street and walking in to the building. Do NOT include any individuals in the photos. Capture the signage and exterior of the building from a street view. Photos are not allowed to contain Photoshop images. Remember: If approved, the exterior photo will be displayed on the Storefront Finder Tool and will be visible to consumers. The photo should be clear, at a good angle, and help set expectations for a great consumer experience. 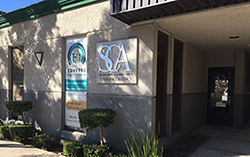 Covered California has created samples of approved storefront signage designs for Certified Insurance Agents and Certified Enrollment Entities that you can download and have printed. These are available in English, Spanish, and Chinese. Check back for more options in the future. Must be Covered California branded and follow the Covered California Branding & Marketing guidelines for Certified Insurance Agents and Certified Enrollment Entities. Must be clearly visible and legible from the street. Display “Certified Insurance Agent” for Certified Insurance Agents and “Enroll Here” for Certified Enrollment Entities. Storefronts located in commercial buildings where owners do not allow for exterior signage in front of the building, should place signage in the lobby of the building or by the sidewalk. To apply for the Storefront Program, please complete the application by clicking on the corresponding button below. All Applicants will be notiﬁed of their selection status within 2-3 business days. By completing this application you agree that your Storefront will be included in the Storefront Finder Tool. Please note: If the signage size does not conform to the minimum size requirements described above or if you are using signage other than the provided options, Covered California will review on a case-by-case basis. Covered California reserves the right to approve or deny Storefronts for any reason. By selecting the links below, you are agreeing to have read and understood the Storefront Background, Eligibility and Signage Requirements and my Storefront meets the criteria.